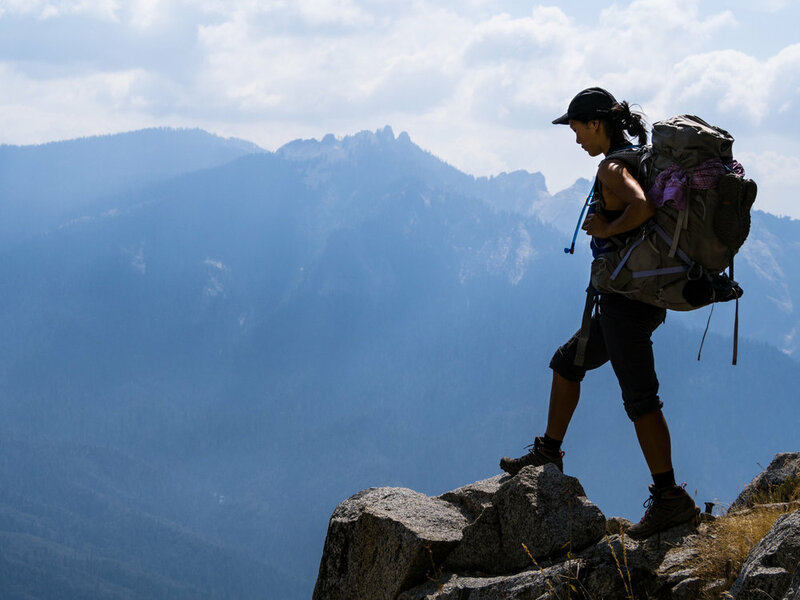 Our first day of our High Sierra Trail backpacking trip was certainly a memorable one and a great way to kick off our week in the mountains! 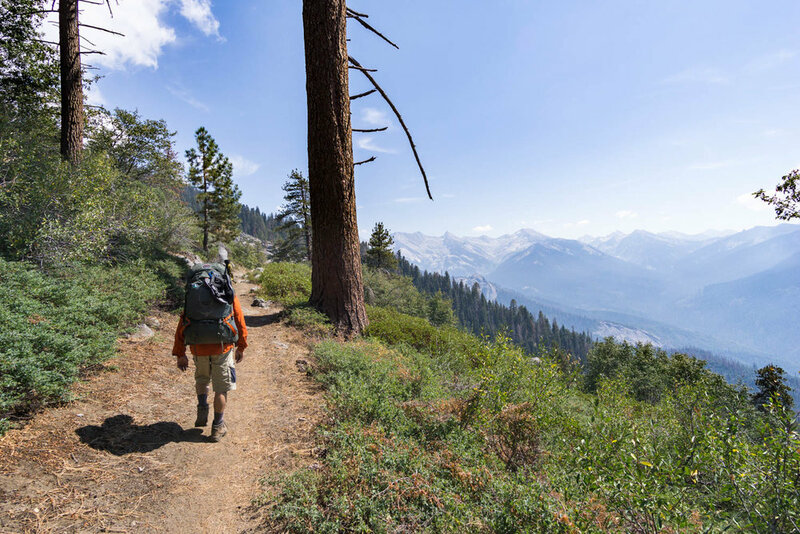 The trail from Crescent Meadow makes its way along an exposed canyon wall that offers vast views of the Great Western Divide and the canyon below. What an incredible start to the trail, as these were some of the best views of the trip. I also loved the looming mountain range in the distance that we would eventually be crossing, since seeing it from the start of the trail certainly put what we were about to do into perspective. Even though we only covered 9 miles this first day, there was a lot of up and down resulting in a decent amount of elevation climbed that isn't reflected in the net elevation change. Right off the bat we definitely felt the altitude, and the low elevation was a nice warm up to the rest of the week. 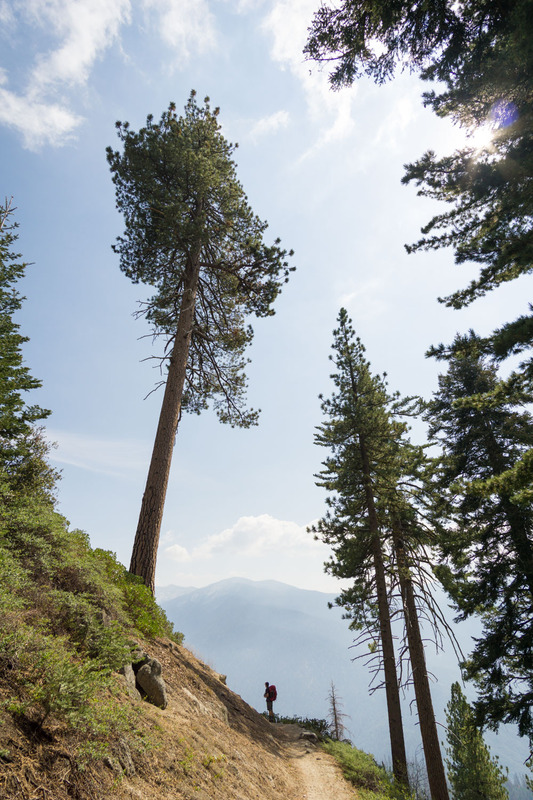 If you're feeling up for it, keep hiking and make camp at Bearpaw Meadow. 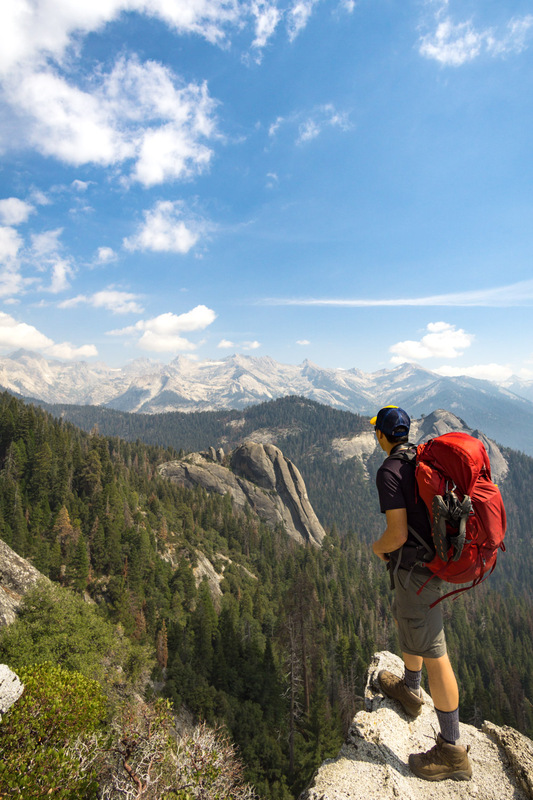 Finally, the day we start our High Sierra Trail backpacking trip has arrived! Coming from Visalia, the drive was about an hour 45 minutes on a one lane, windy road curving up the mountain side of Sequoia National Park. 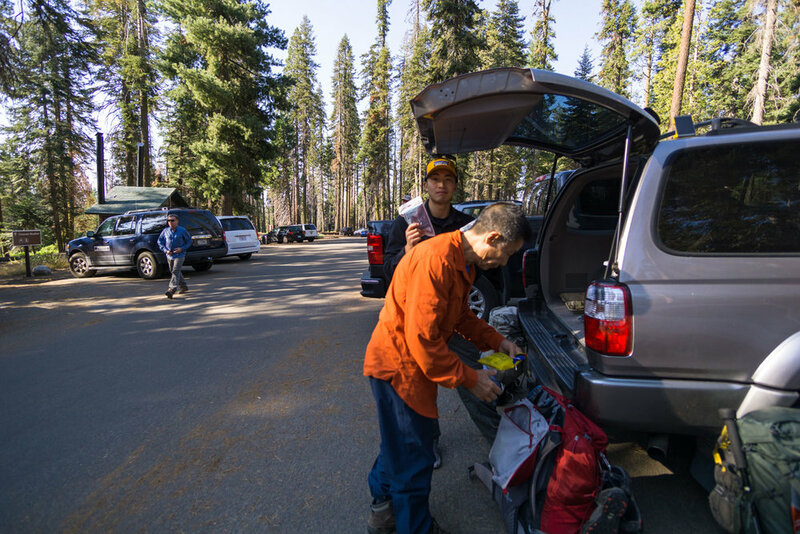 We arrived at the Crescent Meadow parking lot by 9am, ran through our pack lists to make sure we had everything for the week, tossed any leftover food into the bear boxes at the trailhead, and headed off on the start of our week long backpacking trip! Click here to read about how we set up our transportation for this one way hike! Which should we bring? Both? Ok! And we're off! I love the look of the forest in the morning when the golden light shines through the tree canopy. This part of the trail was surprisingly lush, and the Crescent Meadow trailhead seemed to be relatively hidden from the dayhikers, most of them in this area want to see the famous tunnel log. We would be covering a lot of different terrain today, and the green meadows and moss-covered trees in the beginning were refreshing to hike through. 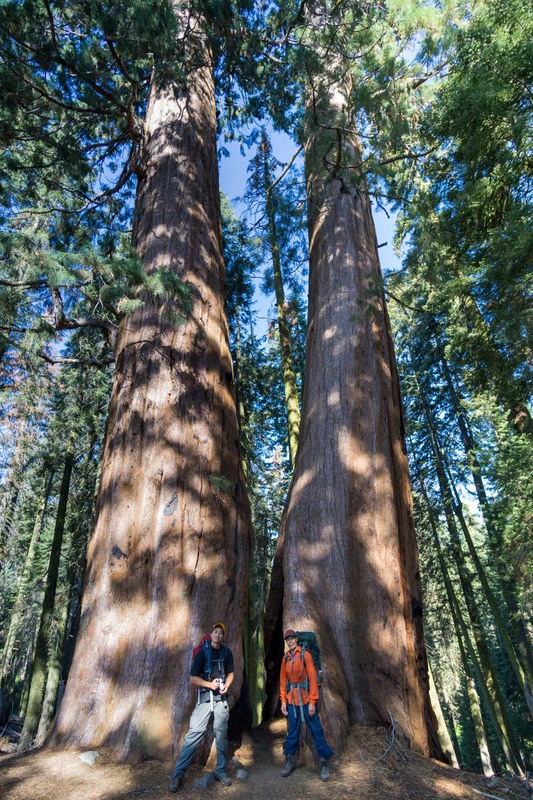 The first mile of the trail steadily climbs up and winds through some of the big trees that Sequoia National Park is known for before opening up to views of the vast canyon below. It's about a one mile hike to the first of many vistas to come - Eagle View. The slight haze or smoke made the layers of the mountains seem even more dramatic. The trail continues steadily gaining elevation along the side of the canyon wall with views of the distant mountains that make up the Great Western Divide. We kept looking out to the mountains far away trying to figure out where Kaweah Gap was - the point where we would be crossing over the tall mountain range ahead of us in the next couple of days. We passed the trail junction with Wolverton Cutoff, and then we crossed about 6 small streams flowing across the trail down into the canyon before we stopped for lunch at Mehrton Creek, about 6.5 miles from the trailhead. Mehrton is the first available camp site on the High Sierra Trail with bear boxes and plenty of flowing water, be we felt good and pressed onwards. After lunch, we passed about three more streams, Sugarbowl Dome, and Little Blue Dome below us. It was hard not to stop to take photos every time the trail rounded a corner and a new section of the canyon came into view! The trail doesn't seem to gain any obvious elevation, but it does gain about 900 ft from Crescent Meadow to Mehrton Creek. Since we didn't have a day to acclimate and our packs were the heaviest on this first day, we were definitely feeling the altitude. We decided we would cap the day at 9 miles and aim to camp at 9 Mile Creek, aptly named. Check out this cute little guy we spotted hiding under a tree branch on the trail! Looking out to the Great Western Divide. Can't believe we'll be hiking over those mountains! 2.5 miles later, we arrived at our first camp site of the week - 9 Mile Creek! The bear boxes were located near the trail, but we followed a small use trail up the hillside to more campsites well away from the trail, and there were lots of great flat sites here. There were nails posted into several of the trees for easy hanging, and we even found a clothesline we could use to hang clothes to dry. Our campsite was well protected within the trees and was close to a pool of water that the 9 Mile Creek cascaded into - perfect for pumping water throughout our stay there. The site even had the perfect fire pit complete with rocks and log benches. We were the only ones camped here for the night, even though we saw a couple other groups pass by and continue on, likely to Bearpaw, which was another 2.5 miles away. The sunset over the dramatic mountain layers in the distance made for some vivid red and purple hues, enhanced by the haze and smoke from distant wildfires. We were excited to have a campfire at night, as usually when backpacking the Sierra, most trails take you above the fireline. And being in a wooded forest, there was no shortage of wood to burn here at 7,546 feet. Since my duty was to carry half of the food for the trip, I was ready to make our first meal and start to lighten the load! Gathering around the campfire to eat as the sunset was the perfect way to end our first day on the trail. This day quite hard for me, as this was the heaviest pack I've ever carried. My glutes were on fire most of the day, and my hip flexors started hurting so much that it was painful to walk by the end of the day. Good thing I brought a tennis ball for foam rolling to help loosen up some of those muscles! Exhausted from our first day on the trail and still adjusting to the high elevation, we headed to bed early, ready for day 2.